U.S. first lady Michelle Obama and television presenter Oprah Winfrey participate in the White House's "United State of Women" summit in Washington, June 14, 2016. First lady Michelle Obama focused on women striking the elusive work-life balance in an interview with Oprah Winfrey at the first White House summit on the State of Women. 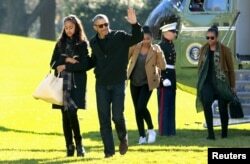 "I had had Malia, Barack was in the U.S. Senate, so I was basically mothering part time on my own, having, I had a full-time job," said Obama, recounting the story of negotiating a job as vice president of community outreach for the University of Chicago Hospital. Like many women, Mrs. Obama thought that negotiating a part-time position would give her more flexibility at home to be a mother. "I tried part time because I thought, I have to figure this out, I have to be able to pick the kids up, I’ve got to be able to do all this. So I tried part time," she said. Obama told the summit of more than 5,000 people, "The only thing I found out from part time was that you just get paid part time." "So I had vowed that if I continued to work, that I would never settle for part time," she said. "I knew what my time and energy was worth." 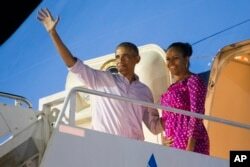 FILE - President Barack Obama, left, and first lady Michelle Obama wave as they board Air Force One to depart from Joint Base Pearl Harbor-Hickam at the end of their family vacation, Jan. 2, 2016, in Honolulu, Hawaii. Last year, 27 percent of working mothers with children younger than three worked part-time, while just six percent of working fathers did the same, according to statistics released by the U.S. Department of Labor. As the gender pay-gap persists, many women blame the lack of advancement in their careers on interruptions to take care of their families. Though U.S. perceptions are changing, 79 percent of Americans reject the notion that women should return to a traditional role in society, only 16 percent of adults say that having a mother who works full-time is ideal, and women are still much more likely to make changes in their work life to support their family than men. Forty-two percent of working mothers in the United States say that at some point in their career they reduced their work hours to care for a child or other family member, as opposed to just 28 percent of working fathers in 2013, according to the Pew Research Center. Women are twice as likely to say that this change in their work life hurt their overall career. Michelle Obama also called on fathers to be more proactive in sharing the burden at home. "Be better!" she exclaimed to the many men in the room. "Do the dishes. Don’t babysit your children. You don’t babysit your own children. Be engaged. Don’t just think going to work and coming home makes you a man." Yet for many mothers, going part-time is not an option if they don't have a partner to support them financially. Single mothers are a rapidly growing population in the United States. As of 2013, fewer than half of American children under age 18 lived with both parents. But women find themselves asking a question rarely posed by men - can I have it all? For many women feeling fulfilled and present at home with their families, while whole-heartedly pursuing a career doesn't seem possible. But Obama advises young women to stop pondering the question entirely, claiming that having it all is a "ridiculous aspiration". "So, no, I don’t want young women out there to have the expectation that if they’re not having it all that somehow they’re failing," she said. Obama does not advocate, however, for women to be happy with their status in 2016 America, warning young women who think that equal rights have already been achieved. "We can’t afford to be ignorant. We can’t afford to be complacent. So we have to continue the work."